As part of its 'High-Speed CompactPCI® Initiative', Kontron is showcasing its first 3U CompactPCI® Serial (CPCI-S.0) processor board at the Embedded World 2013 trade show in Nuremberg. The Kontron CPS3003-SA comes equipped with latest 3rd generation Intel® Core(TM) i7 processors and, for the first time, offers PCI Express Gen 3.0, USB 3.0, SATA 6G and Gigabit Ethernet over backplane. 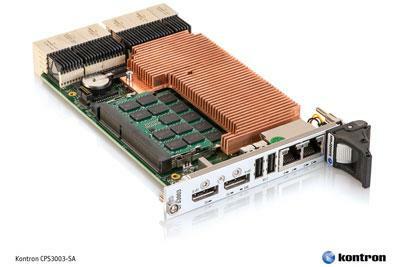 This paves the way for completely new application scenarios and can greatly boost performance in comparison to classic CompactPCI® installations. Significant interest in CompactPCI® Serial has been identified in numerous market segments including industrial automation, test and measurement equipment as well as transport and traffic systems and also include medical and defense technology. At the same time, the new Kontron CompactPCI® Serial class processor board is very flexible. For OEMs, who still rely on classic CompactPCI® boards, Kontron offers the CPS3003-SA as an option in combination with a CPCI extension module. This means that both CompactPCI® Serial boards as well as classic CompactPCI® boards can operate together in a hybrid system. This enables OEMs to easily continue using existing boards without any re-design or requirement to replace their existing CompactPCI® boards. Not only are OEMs provided with a clear migration path to a high speed point-to-point connection of CompactPCI® Serial, but they can also optimize their applications' time-to-market and product lifecycle to minimize their total cost of ownership. Kontron's CompactPCI® Serial processor board CPS3003-SA in detail Kontron's new CompactPCI® Serial processor board is available in multiple versions and scalable from the 1.7 GHz dual-core Intel® Core(TM) i7 processor 3517UE to the quad-core Intel® Core(TM) i7 processor 3612QE. 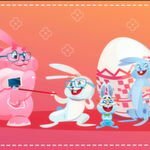 For memory-hungry applications, it offers up to 16 gigabytes of ECC DDR3 SDRAM. The Mobile Intel® QM77 Express chipset already provides numerous interfaces by default, so that the processor board delivers a high performance density in the smallest of spaces. The whole spectrum of serial point-to-point interfaces is accommodated in just 3 units of height: peripheral boards which are especially data-intensive can be connected via two PCI Express Gen 3.0 fat pipes with x8 or x4 lanes. Additionally, five PCIe x1 lanes are available. Hard disk carriers, such as the Kontron CPS3101, can be connected via four SATA ports, two of them via SATA 6Gb/s ports. Plus, there are two USB 3.0 as well as six USB 2.0 ports routed to the backplane. For networking purposes, there are two Gigabit Ethernet ports, which can be routed to the front panel or to the backplane. Additionally, OEMs are presented with two additional USB 2.0 ports and two DisplayPort connections on the front. Furthermore, the CPS3003-SA provides the option to offer rear I/O via the P6 connector, which adds two USB ports (1x USB 3.0 and USB 2.0), a third independent DisplayPort and two serial ports. The Kontron CPS3003-SA supports Linux, Microsoft Windows 7, Windows Embedded Standard 7, Windows XP and VxWorks. Highly integrated Board Support Packages cover all the hardware components integrated on the board. The Kontron CompactPCI® Serial processor board is now available as a COTS component or as an application-ready platform pre-integrated in Kontron's CompactPCI® Serial systems. For further information on Kontron's 3U CompactPCI® Serial processor board, please visit the CPS3003-SA product page. 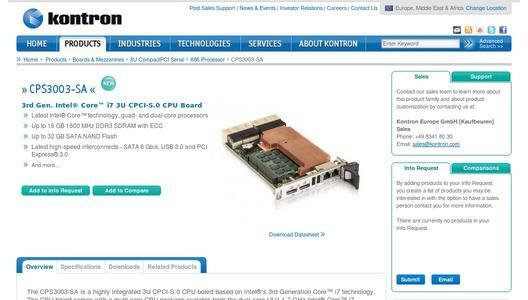 Further information is also available at Kontron's CompactPCI® Serial website.